Thousands of pet owners work all day, and this requires leaving your dog home while you work. Often these owners come home to a stressed out dog, and rampant destruction, either of the house, or the yard, and neighbors who complain of barking and howling, due to separation anxiety. Doggy daycare works just like Daycare for human babies. Dropping your dog off in the morning on the way to work, and while you slave away, your pampered pooch is pampered indeed! Depending on both your dog's activity level, and the curriculum set out by the Daycare owners, he may enjoy his day by playing with other dogs, playing with people, inside or outside, or he may be the type to while away the hours ensconced on somebody's couch, getting loving attention. Cost can vary between $8.00 a day and $35.00 a day, depending on the provider, whether the daycare is operated out of a private home, or a fully-staffed facility. A fully-staffed facility offers much for social dog. Often the number of dogs on a day at these places can be from ten to twenty dogs, all ready to make friends. Trained staff keep the dogs busy in outdoor play, or even, in some cases, happily munching snacks (healthy, of course!) watching movies made just for the entertainment of dogs. Activities might include "hide and seek", or "tag", or anything that canine minds can come up with. Staff is often trained to deal with any outbreak of aggression that might result, and also has a standing agreement with a local veterinarian should an emergency arise. Bark Place - Boston, MA - The Bark Place PlayCare Studio is available weekdays 7:00 AM to 7:00 PM with playrooms spacious enough to run around and lots of human attention and canine companionship. Dogs are grouped into playgroups according to size and temperament. There is no membership or registration fee but all dogs must be registered prior to attending and be current on rabies and vaccinations. Doggie DayTrippers - Boston, MA - Doggie Daytrippers are experts in providing specialized companion animal care within Boston, MA. The company is committed to providing the finest care to customer's canine companions. They offer the safest play groups and the best locations for your four legged friends. Doggie Daytrippers offers day care, fieldtrips, hikes and walks to dog owners and their canine pets. They have been servicing the Greater Boston area for over 10 years. Dinah's Doggie Daycare - Torrance, CA - At Dinah’s Doggie Daycare, your dog can play with other dogs in a safe and supervised setting. We have several different play areas with doggie designated equipment. Your dog will make friends and have a great time. They will exercise and socialize with other dogs … resulting in a happier, more fit dog. Grateful Dogs Clubhouse - El Segundo, CA - Grateful Dogs is an indoor/outdoor cage free environment that is over 15,000 square feet. Our services offered are: doggy daycare, overnight boarding, and basic grooming. 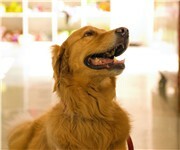 We also have a professional training center and don't forget to check out our Doggy Boutique. The Grateful Dogs Clubhouse is truly is a dogs' world. They'll have the time of their life at our spacious, airy, cage-free facility. With 10,000 square feet inside and 5,000 square feet outside play area. There is plenty of space for your pup to run, romp and wrestle with their favorite pals. South Park Doggie Daycare Spa - Los Angeles, CA - "Our mission is to make your dogs happy when they are here and for you to be happy when you pick them up. By providing exceptional service and offering the best prices in Downtown we are sure you will be happy as well. We offer a comfortable and safe environment weather its daycare, boarding, grooming or training. We also have a full line of premium dog food, treats and toys. Our experienced staff offers lots of play love and fun. We hope that South Park Doggie Daycare will be your next stop for your "dogs day out"! We are located in South Park, in the heart of downtown Los Angeles, just a few blocks from the Staples Center and Ralph's. We look forward meeting you and your doggie for a great fun day at South Park Doggie Daycare." Furry Tales Doggy Daycare - Los Angeles, CA - Furry Tales is a unique daycare center for your canine "kids". We are located in downtown San Diego and offer 3000 square feet of indoor play space in for your pet to run freely and to play with other dogs. We have plenty of toys to keep them amused. We also have beds for added comfort at 'nap-time'. Pets are fully supervised at all times by our dedicated and trained staff. Your pet will be walked several times during the day and given plenty of attention. We have filtered water for them to drink and rubber flooring to protect those paws and joints. Camp Run-A-Mutt - San Diego, CA - Camp Run-A-Mutt is San Diego's favorite cage free doggie daycare and boarding facility featuring over 4,200 square feet of indoor/outdoor fun in a fully supervised, clean and safe environment. Watch your camper online as they run and play in the spacious grassy area, cool off in the custom waterfall/splashpond, relax on the sun deck or under the cooling misters on a hot day. We also offer dog wash, grooming, boutique, obedience training by Beckman's Dog Training and surprises you will find only at CAMP RUN-A-MUTT that you and your dog will love. Barking Lounge -Seattle, WA - The Barking Lounge provides dogs with supervised playcare 24-hours a day. Our focus is on creating a safe, secure, and fun environment in which your pooch will interact, learn and play with other dogs under the close supervision of our trained Dog Wranglers and Staff. We are conveniently located in the heart of South Lake Union/Downtown Seattle with easy access to I-5 and Hwy 99/ Aurora Ave. As our guest, your pooch will spend the day playing with its peers in either the "Big Dog", "Small or Shy Dog", or "Puppy" off-leash play areas, and at any time your dog can choose to relax in a "Quiet Corner". Our overnight guests will snooze in our deluxe canine condos, cozy doggie dens, and spacious pooch runs with staff supervision, and in addition to playing with the daycare dogs, will be walked in the morning and the evening. Great Dog - Seattle, WA - "We provide great services for great dogs and cats. Throughout our 8000 square foot facility, you will find that Great Dog offers innovation, dedication to your pet and an emphasis on fun. We love pets, we love what we do and it shows in our work. While we encourage you to stop in any time for a personal tour, please take a minute to look through our web pages and take a photo tour of our facility. We offer dog daycare, adventure park, overnight care, grooming, dog walking, dog obedience, a "play and train" program & canine education classes." 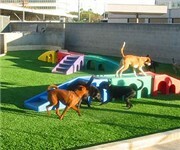 At Great Dog Daycare your dog will enjoy over 7000 square feet of indoor-outdoor play areas. We have multiple trained staff members to offer snuggles & oversee playtime activities. At Great Dog, we have lots of other canine buddies for your dog to play with. Our great dogs get the to take full advantage of your toils at work or while you run errands. As a "Great Dog" your dog will get to dash through swimming pools, jump into a game of soccer, play fetch, learn through obedience stimulating activities, try some laser tag fun, partake in sunbathing, socialize at sprinkler parties and more! At Great Dog, your dog will participate a safe, fun atmosphere & will enjoy getting tuckered out during the day. The Barkway - Denver, CO - The Barkway is a doggie daycare and overnight boarding facility offering live web cam video, clothing, accessories, obedience classes and tubs for grooming pets. The Barkway donates a portioin of their profits to local animal shelters. For the Love of Dog - Glendale, CO - For the love of dog is not your ordinary doggie day care. We are Denver's poshest, coolest and most inviting place for your dog. Imagine a place for your dog that is the equivalent to your favorite spa. Fresh smelling air, clean and safe rubber floors, soft pillows, exercise equipment, kiddy pools, filtered water, only the healthiest treats and tons of love and attention. And best of all, we are completely crate-free. We understand you want your dog to play, socialize and have a fantastic time and crating them for nap time just doesn't fit into our concept of fun and compassionate animal care. D is for Doggy - New York, NY - D is for Doggy presents a new breed of dog care designed to meet the needs of urban hounds. Unlike many existing providers, we offer care programs based on the principles of animal behavior and expert dog training techniques. Driven by our love for dogs, we strive to enrich your pet's life with a complete care experience. The Wagging Tail Doggie Day Care - New York, NY - Doggy day care begins every day at 7:00am and ends at 10:00pm, includes Breakfast and Dinner as well as two Rest Periods. During the day your dog will have nine hours in our playground to romp and play with an average of 70 other dogs, usually more on Holidays and less on the weekends. Your dog will run and play all day with dogs of it’s own size and energy level, then go home to you well exercized and happy or retire with us to his/her our private area for the evening. Eva's Play Pups - Brooklyn, NY - At Eva's Play Pups, we provide a safe, clean and fun environment for you canine friends to do all the doggy things they love to do even when you have to be at work. Under the trained, caring and watchful eye of our human "pack-leaders", dogs can socialize, play, run, chew, sleep, drool, sit, stay and bark till their heart's content! By the end of the day, they will be ready to come home and enjoy your company! Unleashed Dog Daycare - Chicago, IL - Unleashed offers Chicago dog owners a pet haven for dog training, dog boarding, dog day care, dog walking, and dog grooming. Our 9,000 square foot dog day care and dog kennel in the heart of Lincoln Park boasts a friendly and knowledgeable staff focused on creating a safe and clean environment for your dog. Our staff members are pet/dog first aid and CPR certified. Dog boarding options begin at oversized dog suites and progress up to full room penthouse suites. Central Bark Doggy Day Care - Chicago, IL - There are those who give their dogs food and shelter, and those who give them so much more. You know who you are. And you're not alone. At Central Bark®, we're as committed to your dog's happiness and well being as you are. Since 1997, we have dedicated our unparalleled industry experience to providing your 4-legged family members with a fun, friendly, action packed alternative to lonely days at home. Plus, we give pup parents a break in their busy schedules -- and from dreaded dog guilt! Our dog parents are committed to giving their dogs the very best. Central Bark Doggy Day Care is a One-Stop-Shop for all of your canine needs.